Siemens researchers have developed a new type of electric motor that, with a weight of just 50 kilograms, delivers a continuous output of about 260 kilowatts -five times more than comparable drive systems. 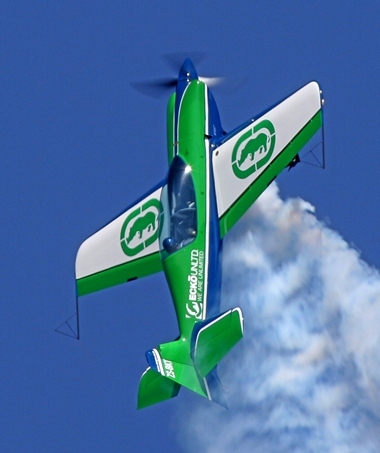 This record-setting propulsion system successfully completed its first public flight today at Schwarze Heide Airport near Dinslaken, Germany, where it - almost silently - powered an Extra 330LE aerobatic airplane. The new drive system had already made its maiden flight on June 24th 2016. 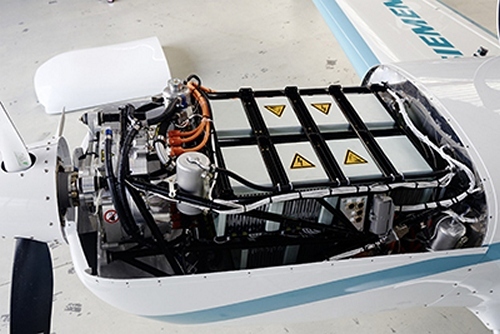 This advance means that hybrid-electric aircraft with four or more seats will now be possible. 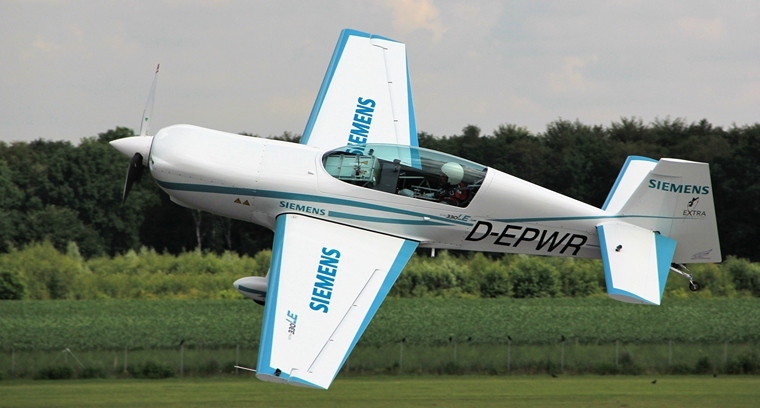 "This day will change aviation," said Frank Anton, head of eAircraft at Siemens' central research unit Corporate Technology. "This is the first time that an electric aircraft in the quarter-megawatt performance class has flown." The Extra 330LE, which weighs nearly 1,000 kilograms, serves as a flying test bed for the new propulsion system. 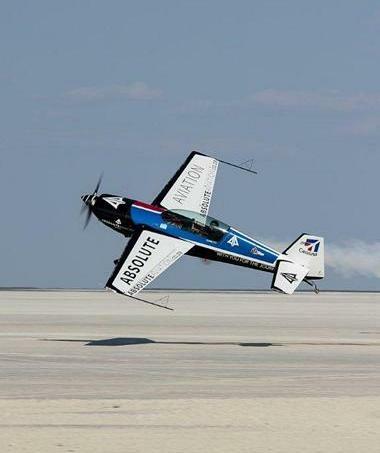 As an aerobatic airplane, it's particularly well suited for taking the components to their limits, testing them and enhancing their design. In addition, the company will be contributing this technology to the cooperative project that Siemens and Airbus agreed to in April 2016 for driving the development of electrically powered flight. Electric drives are scalable, and Siemens and Airbus will be using the record-setting motor as a basis for developing regional airliners powered by hybrid-electric propulsion systems. "By 2030, we expect to see initial aircraft with up to 100 passengers and a range of around 1,000 kilometres," explained Anton. The Spartan Executive 7W is a beautiful luxury aircraft built by Spartan Aircraft Company in the 1930s. It's rare to see one and seeing two or three together is nearly unheard of. Spartan Executive 7W buffs dream of having this exact experience. Because 2016 is the aircraft's 80th anniversary, those dreams are made possible with seven confirmed 7Ws on display at AirVenture 2016. From 1936 through 1940, 34 7Ws were produced. Today, 20 survive and many are rarely flown. It is uncommon to see so many in one place, as the production was spread out over five years and owners are scattered across the U.S. and U.K. This gathering may be the first time since original production that this number of 7Ws have been in one place at the same time. 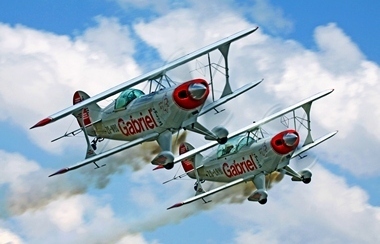 Six are flying in specifically for AirVenture, joining the one on permanent display at the EAA AirVenture Museum. Spartan Executive 7W owner Jim Savage said, "The Spartan owners are thrilled to be able to have this 80th Anniversary Gathering at AirVenture 2016. We look forward to sharing the histories of each aircraft with vintage enthusiasts from around the world." The majority of civilian aircraft at the time were built using fabric coverings and wooden spars and ribs. The 7W featured innovative technology with an all-metal fuselage and a retractable undercarriage, powered by a 450-hp Pratt & Whitney Wasp Jr. engine. Spartan Aircraft Company founder William Skelly wanted to develop an aircraft that was fast without skimping on comfort and luxury. The 7W has a cruising speed of 200 mph and a range of about 1,000 miles, which was impressive for that era. The aircraft's excellent performance allowed the 7W to take part in the 1939 Bendix Trophy Race. Arlene Davis raced from Los Angeles, California, to Cleveland, Ohio, taking fifth place with an average speed of 196.8 mph. Spartan Aircraft Company was based in Tulsa, Oklahoma, which was the oil capital of the world at that time. Most of the original purchasers of the 7W were oil company executives. 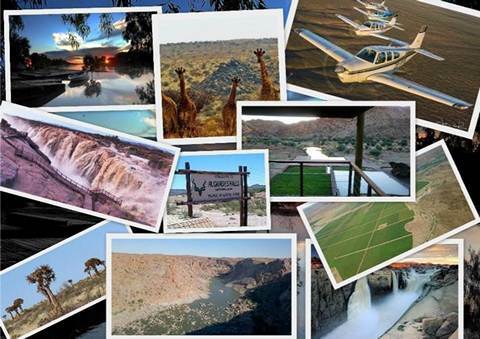 Other notable owners included Paul Mantz, Howard Hughes, and King Ghazi of Iraq. China last week inducted its largest indigenously-built transport aircraft Y-20, a breakthrough in military aviation technology for the PLA that allows the world's largest force to transport cargo and troops over long distances in diverse weather conditions. "The Y-20 entering into service marks a crucial step for the Air Force improving its strategic power projection capability," Air Force spokesperson Shen Jinke said. With a maximum take-off weight of 200 tonnes, the Y-20, which officially joined the PLA Air Force in Chengdu, is ideal for transporting cargo and personnel over long distances in diverse weather conditions, state-run Xinhua news agency reported. The Air Force needs more and better transport to better fulfil its military responsibilities, including safeguarding national security as well as domestic and international rescue and relief work, Shen said. The Air Force has provided aid and delivered relief supplies to Pakistan, Mongolia, Thailand, Nepal and other countries as they were hit by disasters in recent years. The indigenously designed and developed Y-20 took its maiden flight in January 2013 and made its debut at the 10th China International Aviation and Aerospace Exhibition in November 2014, Chinese officials said. The Y-20 is comparable to the Russian-made IL-76 and the US C-17. PLA officials earlier said Y-20 is more advanced than the IL-476. TheY-20 which made its maiden flight in January 2013 and underwent trials runs, including in the rugged Tibetan terrain, will make troop deployment easier, enabling the military to act more promptly and respond to emergencies in a better manner, officials said. It is also regarded as a major breakthrough in military aviation technology for the PLA which is more reliant on Russian-made planes so far. Besides manufacturing J-15, China's first-generation multipurpose aircraft for the newly-built aircraft carrier, Chinese military has tested J-31, a fifth generation aircraft, and stealth fighter J-20, which PLA officials claim to be comparable with US versions. A consortium made up of China Aviation Supplies Holding Company (CAS), Qingdao United General Aviation Industrial Development Company (Qingdao United) and CITIC Offshore Helicopter Co. Ltd (COHC) has ordered 100 H135 light-twin helicopters, becoming China's first customer to form an industrial partnership to launch a H135 final assembly line (FAL) in Qingdao, Shandong province. 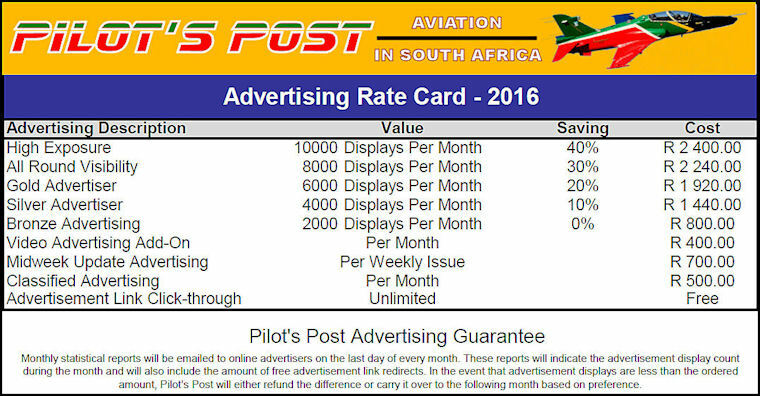 This is an important step forward, fulfilling the commitment of purchasing 100 H135s signed in the Letter of Intent (LOI) last year. "We are extremely pleased with the progress of this partnership between Airbus Helicopters and our Chinese partners. With the further opening up of the Chinese skies and the increasing growth in the civil and parapublic segments, China is gearing up to be the biggest market for helicopters in years to come," said Norbert Ducrot, Head of Airbus Helicopters China and North Asia region. "With their inherent versatility and reliability, these 100 H135s will be best suited to meet the soaring demand in China". The EAA AirVenture Oshkosh fly-in convention, which has earned its reputation as "the world's greatest aviation gathering," will feature the latest members of Daher's TBM very fast turboprop aircraft family - the TBM 900 and TBM 930 - while also highlighting new cabin features available from 2017. Participating in the July 25-31 event - organized annually by the Experimental Aircraft Association (EAA) at Wittman Regional Airport in Oshkosh, Wisconsin - will be a 2016 model year version of the TBM 900 with its system enhancements, and two of the new TBM 930 versions with upgraded cockpits incorporating touchscreen controls. - New voice alerts - providing notification on stall, overspeed, landing gear status and oxygen mask use - which replace aural sounds for better warning identification. One of the TBM 930s at EAA AirVenture Oshkosh also is outfitted with new cabin interior elements that are to be available beginning next year. "AirVenture is a truly great aviation happening, and we are pleased to bring our TBM 930 and TBM 900 for their first appearances at this year's Oshkosh event," commented Nicolas Chabbert, Senior Vice President of the Daher Airplane Business Unit. "For many TBM customers, flying to Oshkosh is a part of the TBM experience, and we look forward to welcoming many of them at what now constitutes the largest gathering of a turboprop-powered aircraft product line at the annual fly-in." The UK Typhoon aircraft will take to the skies at the RIAT show on July 8, 9 and 10 followed by this year's Farnborough International Air Show, with BAE Systems Experimental Test Pilot Nat Makepeace at the controls. 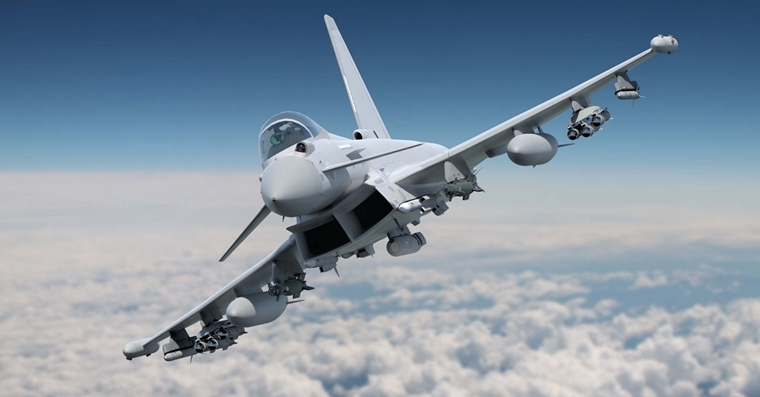 The display will demonstrate Typhoon carrying four Meteor Beyond Visual Range Air to Air missiles, two Brimstone 2 low collateral precision strike weapons (consisting of three Brimstone missiles each outboard wing pylon), two ASRAAM missiles and two Paveway IV laser guided precision weapons. Nat Makepeace, BAE Systems Typhoon Experimental Test Pilot, said: This is one of the first times a Typhoon aircraft has flown with this weapons fit and it demonstrates the significant milestones which have been achieved towards integration of these new capabilities on to Typhoon, providing the combat pilot with a full range of capabilities. Typhoon provides air forces with a highly capable and extremely agile multi-role combat aircraft, capable of being deployed in the full spectrum of air operations. This display will also demonstrate is that Typhoon, even with this weapons fit, loses none of the incredible agility and manoeuverability for which it is known. Embry-Riddle Aeronautical University Daytona Beach Campus pilots Emmy Dillon and Abbie Pasmore were named winners not only in the collegiate division of this year's Air Race Classic (ARC) but also secured first place overall, besting 50 teams for the first time in the school's history participating in the cross-country, all-female air trek. 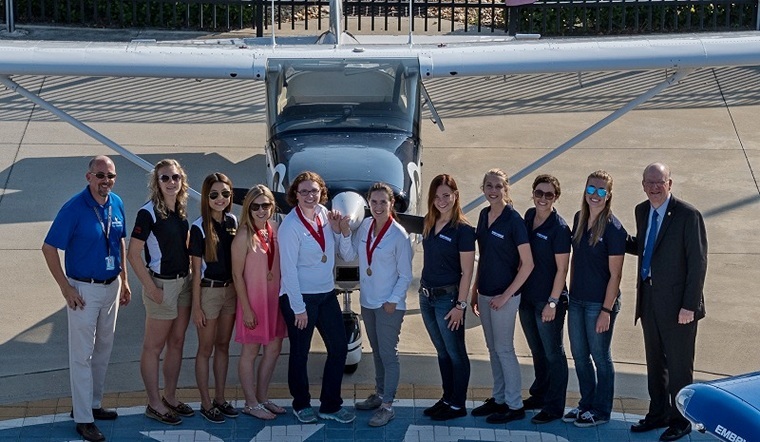 Four teams consisting of female student pilots and flight instructors represented Embry-Riddle's residential campuses in the flight competition that kicked off June 21 at the university's Prescott, Ariz., campus and ended June 24 in Daytona Beach. Winners of the 2,716-mile race featuring more than 100 women were announced Sunday during an awards banquet in Daytona Beach. Another first in the university's history included an independent team (Team Bernoulli) featuring two Daytona Beach Campus College of Engineering faculty Naiara Petralanda and Virginie Rollin who finished third overall in their first attempt at the race. Embry-Riddle Prescott's team of Hannah Rooney and Rachel Hutzell finished in seventh place in collegiate competition and 16th overall, and the team of Shelby King and Hannah Burright were ninth in collegiate and 23rd overall. Embry-Riddle Daytona Beach pilot Sarah Wendt and co-pilot Sojung An as the Riddle Racer Blue Team received numerous nods in the leg/stop competition and finished 16th in collegiate and 42nd overall after having to make a safety stop for maintenance issues. "We're incredibly proud of our pilots," said Dr. Karen A. Holbrook, Interim President of Embry-Riddle, which was the start and terminus host sponsor of this year's race. "To be part of an event such as this that empowers and inspires women is an honor, and it exemplifies the core values of our university - that there are no limits to what you can achieve." With a theme of "Collegiate Cross Country," the annual race was a salute to aviation programs at universities across the country. Other universities that finished in the top 10 in the collegiate division were Indiana State University, University of North Dakota and Liberty University. As Embry-Riddle celebrates its 90th anniversary this year, it also marks 20 years since a similar route for ARC was run between the two campuses in 1996. One of this year's stops along the route was in Albuquerque, N.M., where Embry-Riddle Worldwide offers courses at Kirtland Air Force Base. The women were selected for this prestigious competition by Embry-Riddle College of Aviation administrators from each campus on the basis of their piloting skills, their competitive spirit and their knowledge of aviation, safety, navigation, meteorology and crew resource management. All Embry-Riddle teams flew Cessna 172 aircraft from the university's fleet. Nearly two dozen female pilots with connections to Embry-Riddle as former faculty, graduates of all campuses including Embry-Riddle Worldwide and current students participated in this year's race. Current sophomore and aeronautical science major at the Daytona Beach Campus, Cara Baldwin also competed for the fifth time as part of team Baldwin Family Flyers with her grandmother and aunt. The three generations of women pilots received numerous awards at Sunday's banquet. In previous races, Embry-Riddle racers have delivered impressive results. A Daytona Beach team has participated every year since 2007, finishing four times previously as the No. 1 team in the collegiate division, and until this year, had finished as high as No. 2 in the overall competition twice. Prescott has taken part every year since 2009, ranking as high as No. 2 in the collegiate division and No. 4 last year in the overall competition. USA, Washington: A Delta Air Lines Airbus A-320 with 130 passengers on board landed at landed at Ellsworth Air Force Base when its destination was an airport in Rapid City. Ellsworth is about 10 miles due north of Rapid City Regional Airport. The two airports have runways that are oriented nearly identically to the compass, from northwest to southeast. The crew has been taken off-duty while NTSB investigates. Landings at wrong airports by commercial pilots, while unusual, are still more common than many passengers may realize or airlines would like to acknowledge. Since the early 1990s found at least 150 flights in which U.S. commercial passenger and cargo planes have either landed at the wrong airport or started to land and realized their mistake in time. Of the 35 documented wrong landings, at least 23 occurred at airports with shorter runways, creating potential safety issues. Switzerland, Two fighter jets were scrambled last Tuesday due to an anonymous message was received about a bomb on board its flight from New York to Tel Aviv. Switzerland's air force confirmed that a "sonic boom" heard Tuesday morning was the result of a "hot mission" involving two of its FA-18s. It said in a statement the FA-18s escorted a foreign passenger plane through Swiss airspace. The incident, an apparent false alarm, comes amid heightened security at U.S. airports following the deadly attack on Istanbul's international airport. Egypt, Cairo: Sources from the committee investigating EgyptAir Flight 804's disappearance revealed Tuesday that newly analysed audio from the cockpit voice recorder indicates pilots attempted to put out a fire on-board before the plane crashed into the Mediterranean Sea. Authorities say the recordings, which captured pilot conversations and cockpit alarms, are in line with the evidence of fire damage found in the plane's wreckage. 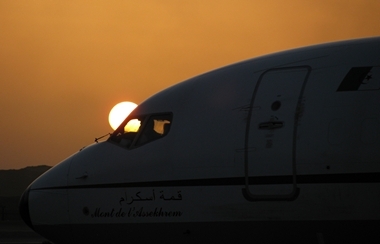 However, the new evidence isn't helping investigators zero in on any one theory of what caused the aircraft's demise, "especially since it is rare for such a catastrophic fire to break out so suddenly," Flight 804 crashed on May 19 en-route from Paris to Cairo, killing all 66 people on board. USA, Ellis County: The Bell 525 Relentless helicopter prototype was destroyed when it impacted terrain in Ellis County, Texas near the towns of Bell Branch and Italy. Bell said in a statement the helicopter was conducting developmental flight test operations when the accident occurred. Both pilots were killed in the post-crash fire. The Bell 525 is a newly developed helicopter by Bell that would be able carry 16-20 passengers. It first flew on July 1, 2015. USA, Denver: A Denver-bound Delta Airlines flight from Atlanta was diverted to Tulsa after at least a dozen passengers became ill due to carbon monoxide ingestion. The effected passengers were taken to an area hospital to be evaluated.. They were all found to have had elevated carbon monoxide levels in the blood. Another passenger was also treated for hypertension. China, Chengdu: A China Southern Airlines Airbus A320 was severely damaged during a hail storm as it descended towards its destination of Chengdu. The battering by hailstones caused multiple cracks across windshields, obliterating the view and forcing the pilots to fly virtually 'blind'. The nose of the plane had most of its paint stripped off by the hailstones with the metal bodywork showing. The leading edge of the left engine fan was also severely damaged. Despite the damage the crew were able to land the aircraft safely. The Sikorsky H-19 Chickasaw, (sold commercially under its Sikorsky model number, S-55) was a multi-purpose helicopter used by the United States Army and United States Air Force. It was also license-built by Westland Aircraft as the Westland Whirlwind in the United Kingdom. Development of the H-19 was initiated privately by Sikorsky without government sponsorship. 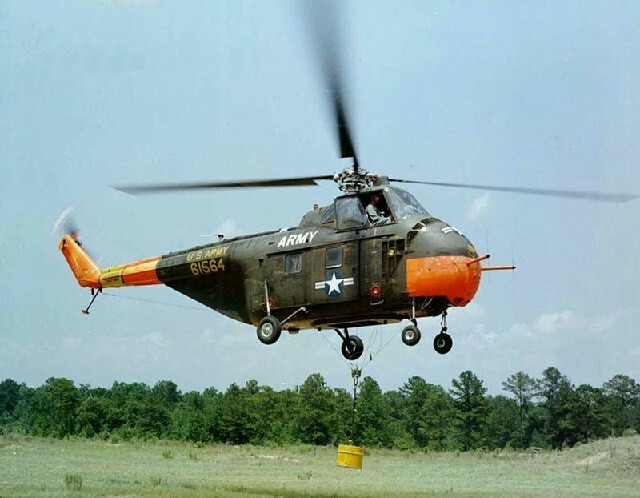 The helicopter was initially designed as a test bed for several novel design concepts intended to provide greater load-carrying ability in combination with easy maintenance. The first customer was the United States Air Force, which ordered 5 YH-19 aircraft for evaluation; the YH-19's first flight was on 10 November 1949, less than a year after the program start date. 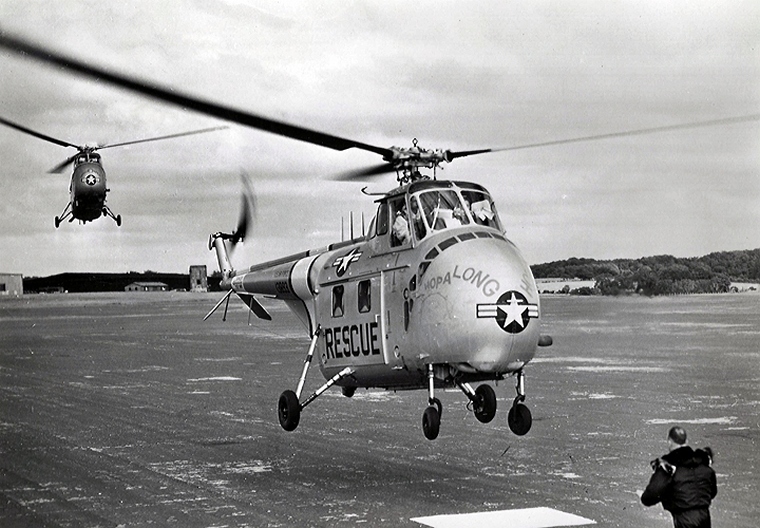 This was followed by delivery of first YH-19 to the U.S. Air Force on 16 April 1950 and delivery of the first HO4S-1 helicopter to the U. S. Navy on 31 August 1950. 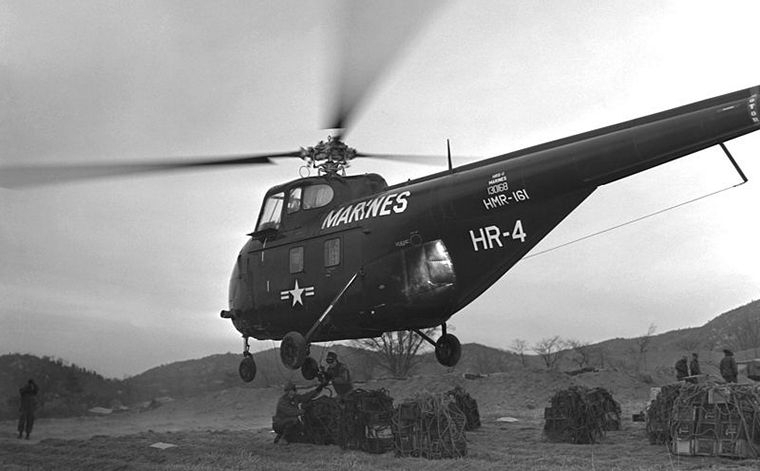 A U.S. Air Force YH-19 was sent to Korea for service trials in March 1951, where it was joined by a second YH-19 in September 1951. On 27 April 1951, the first HRS-1 was delivered to the U.S. Marine Corps, and on 2 May 1951, the first S-55 was delivered to Westland Aircraft. Based on successful operational testing, the U.S. Air Force ordered 50 production H-19A helicopters. On July 15 1952 two H-19A helicopters named Hop-A-Long and Whirl-O-Way, stripped of all unnecessary equipment and with three 100 gallon auxiliary fuel tanks in the cabin, self-deployed from Westover AFB, Massachusetts to Wiesbaden AFB, Germany. The first transatlantic crossing by helicopter followed a great circle route via Presque Isle, Maine - Goose Bay, Labrador - Narsarsuaq, Greenland - Keflavik, Iceland - Prestwick, Scotland. After welcoming ceremonies in Scotland, the two helicopters continued on to Schiphol, Holland and arrived at Wiesbaden AFB, Germany on 4 August 1952, a 4,220 mile trip. The longest leg of this trip was the 850 mile over water leg from Keflavik, Iceland to Prestwick, Scotland.